Don’t mess around when it comes to your dorm laundry. College dorms are known to have narrow halls and slippery stairs which can be a real hazard when both your hands are holding an uncomfortable-to-carry dorm laundry hamper. And adding wheels are a great alternative, but what if you live off-campus and your laundry room requires you to leave your apartment? DormCo's solution: Add a strap to your dorm room laundry basket! Our Hands Free Laundry Basket With Adjustable Strap - White is perfect for when you want to bring down books and your laptop to the laundry room in your dorm building while you wait for your clothes to wash and dry, need a free hand to maneuver slippery stairwells or open doors, or just want to be comfortable bringing your laundry to your dorm or apartment laundry room! Our college dorm laundry hamper comes with an adjustable strap which provides greater convenience when going to do laundry in your college dorm. Able to hold up to 25 pounds of your clothing and dorm bedding, you can finally get all your college dorm bedding and washables down to the laundry room without feeling like you’re literally parading your dirty laundry around your college dorm! 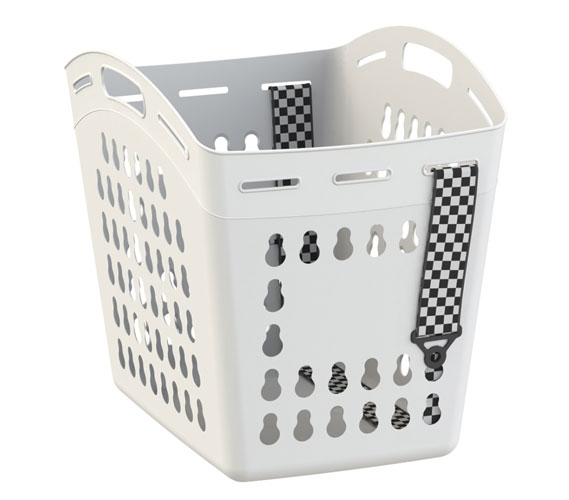 Our neutral white dorm laundry basket fits into any décor style and the retro-styled strap makes it stand out from your dirty clothes (if you accidentally, or intentionally, bury it in dirty clothes) and is easy to find when you want to remove your dorm laundry basket strap. Make doing laundry in your college dorm just a smidge less annoying with our hands-free strapped college dorm laundry basket!